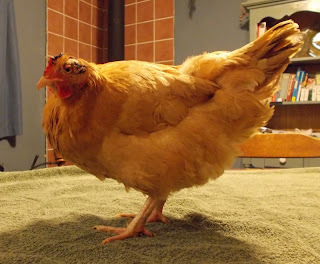 I have not been updating Miss Orpington's progress every day. She is recovering from her injuries, but wounds take time to heal. I wanted to wait until there was some change to report. Happily that change, is all positive. Three days after the attack, Miss Orpington was still not eating. I tried offering favorite treats; scratch, apples, cantaloupe, scrambled eggs, even bread, all to no avail. She drank water with vigor 4+ times each day. We received many caring suggestions from readers and personal friends, but these failed to pique Miss O. 's interest. As the days passed, we began worrying less that she might die from her wounds and more that she might starve. Since she was drinking, we decided to offer some raw egg in a shallow dish. Miss O. took a couple of sips of the egg. That was something, anyway. 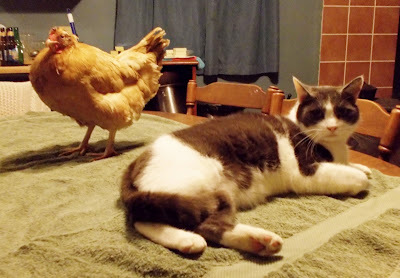 Sean suggested bringing in another hen to keep her company. He thought that if she saw another hen eating, she might become interested and eat something, herself. It is a sound theory. We've spent many an afternoon watching "Chicken TV" episodes of hens chasing each other for spaghetti, fruit slices, and other edible treats. It was worth a try. We needed to keep a good eye on the interaction, though. 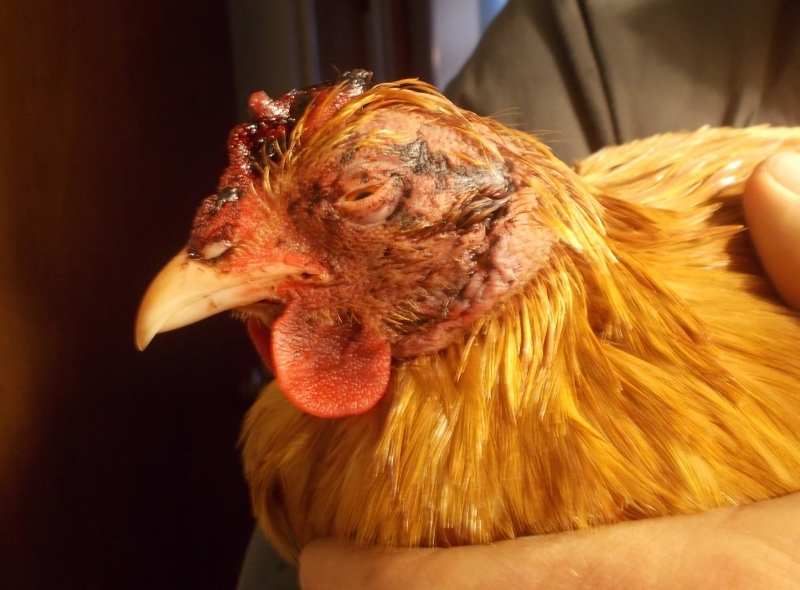 Another peculiar trait of chicken behavior is, when they see an injured chicken, often that triggers more attacks, especially where there is blood showing. 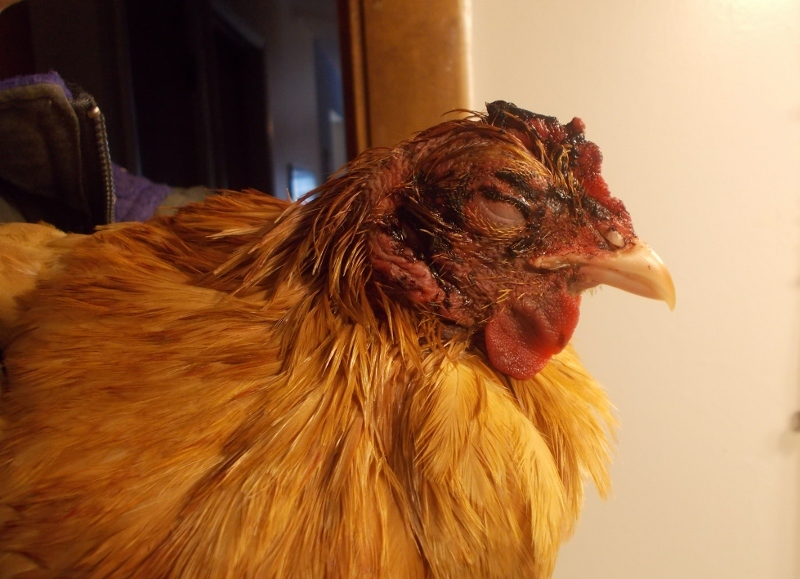 One of our Wyandotte hens had some missing feathers near her tail from our ever-attentive roosters, so we decided that she would be an excellent candidate for this trial. We added Miss Wyandotte on day 4. It worked just as we hoped. Miss O. began eating almost immediately. And, today, Miss O. turned the tables and tried to steal Miss W.'s treats! A good sign of her returning appetite and vitality. Even with the roosters needing new homes removed from the main coop yard, it will be several days still before the hens can be re-introduced to their flock. We want to make sure both hens are fully recuperated and ready before we return them. Additionally, I ordered 2 new chicken saddles from Louise's Country Closet. The good folks there have been a sponsor of some of my favorite blogs for a long time. I had seen the advertisements for chicken saddles before, but Sean and I had never seriously discussed purchasing them until now. I was really pleased with the selection they offered and the price was really reasonable. I used fellow "Farm Chick" Lisa's Fresh Eggs Daily code: FRESH to get 15% off my purchase. As a small family farm business just starting out, we have to watch every penny, but at less than $6.00 for both saddles and free shipping, this was a purchase I felt good about all the way around. I took some pictures this evening to share Miss O. 's recovery progress with you. 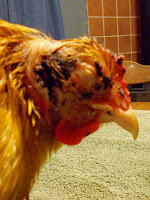 First, a reminder of what she looked like the day after her attack. Today, most of the black and blues are fading. Miss O's right eye is open and more alert; her left eye has begun to open, too. The damage to her comb is less pronounced and beginning to heal. Neither the hen nor the cat minded one another's presence. I minded Machias's determination to be in every shot! We have lots more to share with you in this coming week including: a sneak peek at the photo shoot from last weekend, more soap making, and some surprises in our mailbox. But, it is very nearly midnight and this farm chick is tired. Thanks for stopping in for a visit tonight, friends. I am glad for your company. If you saw a picture you liked, feel free to pin it to your board. I'm so happy to hear Miss O is doing better!!! I am so happy she is doing better and your experiment worked. Those girls are going to be the envy of the chicken yard. They will be stylin' and profilin' in their new clothes! I love that last photo! Of course the cat has to see what's going on!